Not every Martha Stewart craft goes up in flames. Perhaps that is because this was created by Robert Mahar of mahardrygoods.com as linked to by marthastewart.com. Yeah, I still watch the Martha show with Aidan even after being seriously dissed by her craft department because of smoking hand warmers. Whew - that paragraph was full of links. Anyway, Aidan and I were watching Martha's show and saw them demonstrate making this sock skeleton. We loved him! Despite his sour looking face, he was actually easy to make. The only oops I had was that I bought socks with a nice yellow stripe along the toe. I'm pretty sure I specifically looked for socks without any golden toes but I must have spaced out. So I cut off the toe and made a little rounder head. Look how lovely our tree is in the background! I'll be raking that loveliness come next weekend. Then we can depend on a barren tree for months and months and months. I've Jumped on the Paper Globe Bandwagon! Way back in November, I saw paper globe ornaments at Macy's from the Martha Stewart line. Then I saw them blogged on Craft Tutorials. Jeff and I tried one out at Christmas and I forgot about it until late in January when my mom and I decided to make Valentine ones using a double-sided scrapbook paper. I just got around to photographing mine. What is pretty about this one that I didn't photograph is that it is hanging by red and white baker's twine through a hole punch. In the hole, I put a heart-shaped rivet clasp. I know these have been blogged a bit lately and there are tutorials on Martha's site (and no, these didn't catch fire), Heather Bailey's blog (uh, perfect much Heather?) and made hugely on Wisdom Has Two Parts (what are those two parts of wisdom anyway? I guess if I have to ask, I am not wise...). Anyway, I don't think I need to add a tutorial but I will give hints to what I did to make it easier! Make a practice one first with your second rate paper. Buy a paper punch for the circles. I used a 2" one. Have your husband make an isosceles triangle using a protractor out of a lightweight cardboard for folding the triangles. OK - I know you can do this yourself. So could I, I think. It just helped a lot to have my mathematical genius husband (seriously - PhD in psychology with a statistics major) do it for me. Fit the triangle perfectly on your cut circle. Fold one side over your triangle template. Remove template and set it upon that folded edge and fold your next edge. Repeat until the third side is folded. The goal is for the folded edges to all be the same size so that you don't see overlaps when you glue them together. Mine weren't as perfect as others but I was able to minimize the damage. I used a glue stick to attach the pieces to each other. I would attach two pieces and then move on to another pair. Then I would move back to the first pair as the glue would be dried well enough to work on attaching that pair to another circle. I really loved this project. I look forward to making them again! Aidan needs to bring 12 non-addressed valentines to nursery school next month. 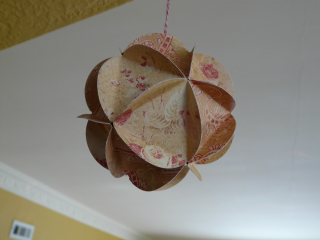 I recalled seeing these doily crafts in a Martha Stewart issue. You turn your heart upside down, fold the two sides in a little, fold up a little of the bottom and then bring down the point to create an envelope. Her site shows an example of how to do it, too. I used gold wrapping paper with notes on it as the inside and glued it on. 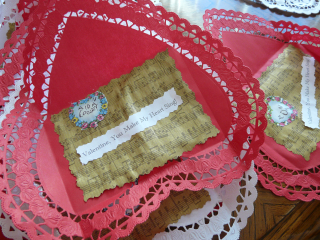 I printed out on the laser printer the "Valentine, You Make My Heart Sing" note for the insert and glued that on. I cut both with Fiskars special edged scissors. Aidan wrote his name on Dresden trim bought from our local Art Store, Artist and Display (the gold paper came from there, too). We glued them on. 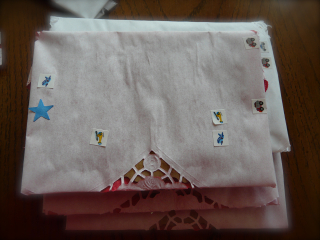 After the glue dried, we folded the cards, added a heart sticker to keep them closed, and as only a 4-year-old boy could, put car, train, and airplane stickers on the back. I sent an e-mail last Friday to Martha Stewart staff. Me: Well, this is more than disappointing for a pattern published by MSLO. Perhaps you could ask Martha? Well, no big deal, right? I'm out about $40 something dollars for the cashmere and pie weights. I'm working on projects with the cashmere. The pie weights aren't too useful to me. I can use some but not all. $40 is not a small amount for our family. And I've heard from others that I'm not the only one! Plus, the number one hit to my blog for the past few weeks has been a search for Martha Stewart hand warmers. What irks me is the fact that I'm kind of a Martha Stewart junkie. I tape her shows and watch them all. I've been a magazine subscriber since 1999 and have subscribed to all her publications except some Body one. I have tons of books and products and have tried many of her crafts and recipes. I've stuck with her through prison, bad interviewing skills on the Martha show, my disappointing Martha show experience, a crummy puppet kit from Martha Stewart Crafts (come to think of it, customer service didn't care about that problem either), a really bad pecan pie recipe, and the fall of Martha Stewart Kids. Heck, I've even given Blueprint a second chance. I don't know how to gauge the reaction from her staffer. I feel like asking her if she wants some antibacterial soap to go with her hand washing. I wasn't looking to sue, just a solution. OK, thanks for letting me vent. I promise to not mention it again unless I have news from them on the subject. At this point, I'm chalking it up as a loss and will focus on the gingerbread men that Aidan and I are making with the cashmere. Miffed at Martha Stewart's Hand Warmers or Should I Say Hazardous Warmers? As you know, there was a Martha Stewart hand warmer fiasco this past week in the Sassy household. I sent an e-mail to Martha Stewart and to their credit, received a quick reply. Me: I bought pie weights and cashmere to make Hand Warmers as found in your Holiday issue last year (and on your website until recently). I made a test warmer and microwaved them per the instructions - the first time was great! The second time - not so great. The cashmere started burning. Is there a way to avoid this? I've invested a bit of money into this project. Thank you. Someone at MSLO: Thank you for writing to Martha Stewart Living. Make sure the cashmere doesn't have a synthetic blend (ie stretch, polyester, rayon). New e-mail from Me: Thank you for your reply! The cashmere does not have synthetic fibers - any other suggestions? Someone from MSLO: You might want to try a lower heat setting or shorter amount of time. Another e-mail from Me: OK. I will look into experimenting. I am giving them as gifts so I'm worried about different microwaves, different heats. I also thought about making sure my thread is 100% cotton. Would adding water in a bowl in the microwave be a bad idea? P.S. Why was this project removed from the Martha Stewart website? Someone from MSLO: Its something you would have to test. Me (not in an e-mail back): Gee, thanks. NOT. Grrr. I didn't want to write back being irritated. And why was this project removed from the website? I'm pretty sure it was even on a segment on the new craft show (I'll have to check my tapes). So, I'm off to waste some cashmere and test using it with water in the microwave as I certainly can't give gifts to people that say - "Test in your microwave - if it catches fire, let me know." We apologize for being unable to direct you further. I wish I had a link for this pattern to share with you but it has been removed from the Martha Stewart website. In last year's Martha Stewart Christmas Holiday issue and I believe on one of the recent Martha Stewart Craft segments, there was a pattern for making nifty hand warmers using pie weights. Basically, you take two 3x5" cashmere squares, sew around and leave an opening to add 1/2 cup ceramic pie weights. Blanket stitch around. Don't try this at home: Put in microwave for 5 minutes, no less, no longer. I made a test one and couldn't fit the entire 1/2 cup of pie weights in it. It also caught on fire. Well, more of a smolder but it busted the seam and the fire hot pie weights fell out. I tried to be smart, outside of buying a 3 jars of pie weights. I only bought a small amount of cashmere. I made a test warmer last night and microwaved it. It was perfect - it was warm for about 20 minutes. So I bought a bunch more cashmere last night! Today, I put it in the microwave again and after about 4 minutes, a foul odor emerged. The fabric had burned. So, unless I find a microwave work-around, I'm out a bit of dough for gifts I was making this holiday season. Interestingly, in the last week or so, this pattern was removed from the Martha Stewart website. I put a message on the Martha Stewart craft board but haven't received a response. I also wrote Martha Stewart in the Ask Martha link. Does anyone else have suggestions? It seems like putting a cup of water in the microwave might help but damp hand warmers don't sound so cozy. And if you are on my gift list, please ignore this post and remember that I will try to not give you a dangerous present. Picture is from the defunct Hand Warmer pattern on the Martha Stewart website. No link available. Umm - it was soooo pretty before I baked it. I used Martha Stewart's Pate Brisee recipe and Williams Sonoma pie dough cutters to make a good pumpkin pie with my mini crust. I made another lovely shrunken Pecan Pie that looked great but tasted awful. 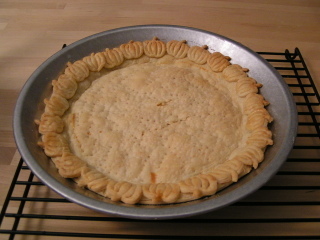 I made a Chess Pie, too. I didn't eat any of them. I was too tired to make my favorite, Coconut Cream. I'm never baking pie again. I really had problems with the crust. I followed the directions to a T but couldn't get the dough rolled out unless I let it sit for 15 minutes or so. Even then, I had problems. When it finally worked, I screwed it up by forgetting pie weights. I'm disappointed with the Martha Stewart pie recipe (though I am sure it was my fault somehow). However, I will take no credit for the lousy Pecan Pie recipe. I don't know why I switched from the one I usually make from Southern Living. Anyway, holiday baking really ruined some of Thanksgiving meal fun. I spent all of Wednesday making pies that I don't even like. A whole day! I didn't even make bread or the turkey. Some of it was poor planning. Some of it was difficult recipes and some of it was a 4-year-old "helper." I really hope to take December off from baking. I don't need the extra calories and want to focus on sewing. 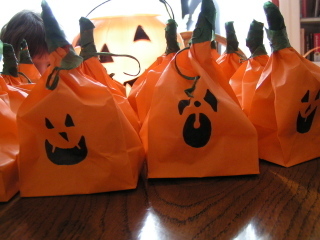 I made these treat bags using an idea from Martha Stewart. I made Jack O Lantern faces on the front and stamped them on the back. I filled them with a small Playdough, Goldfish snacks, and spooky rings for Aidan's nursery school friends. As I mentioned the other day, I received an invitation to the Martha Stewart Show for the special Sewing show. I was so, so excited! That is, until I started researching flights, hotels, etc. Jeff already said that he didn't think we both could go so I started looking into costs for myself and also to go with my sister, Missy. Well, who knew hotel costs were so crazy in New York ($500 and up!)? I guess there is a UN Assembly the same day as the show taping so hotel rooms are scarce. Poor Missy was looking into hotels in Brooklyn and New Jersey. I guess a decision has been made not to go. I have until Wednesday to decide for sure. I know there are more important things in the world but I really love the Martha Stewart products - I receive almost all of the magazines (please bring Kids back! ), tape the show and even burn some to DVD. I have years of issues cataloged by month so I can look at all the October ones together, for instance. I didn't even give up on her when she went to prison. As I love to sew, this show would have been a real dream to go to. As mentioned, there are so many other things in the world to focus on. This comes with the territory of being a stay-at-home mom. I've been telling myself every night how lucky we are to live in the US and be safe and sound in our lives. But then the tears come as I have a pity party for myself. We really have had a rough 4 years and it would do Jeff and I wonders to get away for a couple days. Well, hopefully writing about this will get it off my mind and focus on better things such as Jeff's birthday which officially started an hour ago. Aidan, in all his 4-year-old logic, decided that his daddy loves to play with him so he (Aidan) should get a few toys so Daddy can play with them with him! OMG, OMG, OMG Martha Stewart! So the Purl Bee mentioned a Martha show featuring sewers. I figured what the heck and put my hat in the ring to be in the audience. Today I received confirmation that I have been selected to be an audience member. Yay! Maybe everyone was selected but I will feel special right now. So now what? I live in Wisconsin. I have very little time to plan a trip to New York (show is in 1 1/2 weeks). We are a little tight financially but my husband is encouraging me to go but maybe ...solo. Yikes! I have actually been to New York by myself on a business trip. This was on June 11, 2001. I stayed at the Marriott World Trade Center. Lucky, hey? I had grand time by myself but this time around it may be tough as I will not only miss my husband but also my son. Does anyone have any suggestions of where to stay in New York City that is reasonable but nice? I popped into Michael's today with my mom. I was just tagging along with determined hands in my pockets to avoid buying anything. And then I saw them. 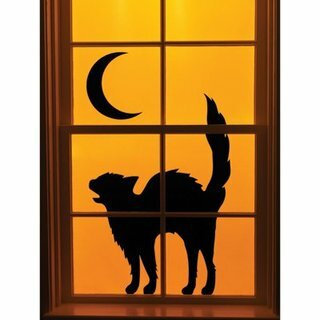 The Martha Stewart Halloween Silhouettes! For only $9.99, I was able to nab the kitty at left. But then they had the witch... and the skeleton... I talked myself into the witch. And then I talked myself into the Halloween Baker's twine and the spooky stickers. There are some cute cupcake liners but I had already purchased a couple or three of Wilton's ghost and pumpkin mini cake pans. I love, love, love decorating for Halloween. Of course, every approaching holiday is my new favorite one. I can't wait to decorate and bake this year. More pictures of my goods after the jump. Our bathroom is short on storage and I apparently have a ton of hairbrushes with no place to put them. 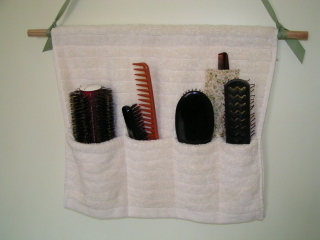 I remembered that Martha Stewart had an idea for an organizer made with a hand towel so I set to. I bought and pre-washed a hand towel that matched my other ones. I bought a 1/2" dowel rod and made a channel on the end for it to slide through. We left about 1 1/2" on each side and used a saw to cut off the dowel and sand the ends. I took a look at my hair-grooming collection and wondered why I have so many brushes when I basically wear my hair in a ponytail every day. 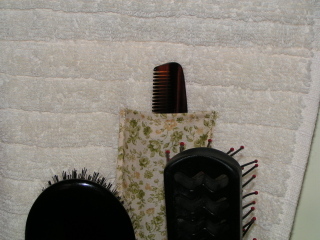 I found a home for each hairbrush along the towel and placed pins to mark the dividers. As the pockets would need a little room to get around the brushes, I made allowances (perhaps 2") extra. I sewed on a little flat pocket for a comb holder. I just measured the comb, added extra allowance so I could turn the ends under for seaming. To make the pockets, I folded up the end of the towel in a double fold and slipped the hairbrushes in to make sure the pockets were deep enough. Channels were sewn where I marked them. Hairbrushes were slipped into place. Dowel rod found its home. Grosgrain ribbon made an appearance on the ends and Jeff put a hook on the bathroom door.